This isn’t much of a recipe, but it was such a hit that I thought it deserved a post anyway. I made a meatloaf one night and we had no potatoes on hand to go with it. 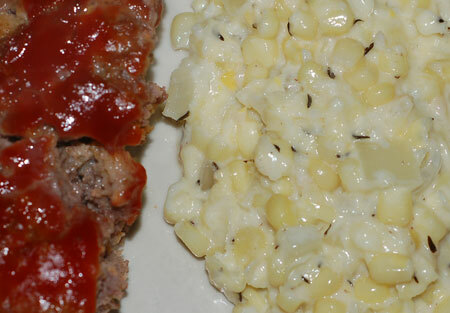 Searching around for an alternative creamy, starchy side dish, I decided to try making creamed corn. Since our only prior experience with creamed corn was the gloppy canned variety, I was pretty skeptical about whether or not it would be edible, so I didn’t make much, but we ended up scraping the pan dry. It was totally improvised, but here is the gist of what I did, for future reference: I sauteed about 1/4 C chopped onion in some butter with 1/2 tsp sugar, some minced garlic, salt, pepper and dried thyme, added a few handfuls of frozen corn and cooked it all together until the corn thawed, then I added just enough heavy cream to cover, buzzed it up very briefly with my stick blender to thicken (leaving about half of the kernels still whole), then just simmered the lot until the cream reduced and the mixture was as thick as I wanted it.